Can Guinea Pigs Walk on Wire Bottom Cages? Guinea pig cages come in all kinds of different shapes and sizes. Some are wooden, some are plastic, some are even metal. They are all made of different materials depending on what the owner prefers. A big favorite of ours is C&C cages where you can piece together pieces together to construct the kind of cage that you want for your guinea pig. They are loved by many for their versatility and adaptability. There are also wooden cages that many owners use outside. These are durable cages that can withstand all kinds of weather. They are treated with chemicals to ensure that they stay durable throughout the seasons. Metal cages tend to be used inside, otherwise, they go rusty. There are many different cages that you can buy for your guinea pigs and one of them is the wire bottom cage. Wire bottom cages are those types of cage that have wire cris-crossed across the floor of the cage instead of wooden or plastic flooring. They can be mesh-wire or harder and formed metal. But the precept is the same with both concepts. So is it safe for guinea pigs walk on wire bottom cages? It really isn’t good for them to do so at all. They will hurt themselves and there is a real danger that they will trap their feet in the wire and get injured. Guinea pigs feet are also very sensitive and delicate and the wire will irritate their feet as they tread on it. However, you may be able to remove the mesh grid from the wire-bottom cage or you could take a wire cutter and cut off the wire bottom of the cage leaving the flat surface which is beneath it. Can Guinea pigs eat Socks? If you’ve had a guinea pig run around your home you’ll know that they will pretty much take a nibble at anything they take a fancy to. This includes taking a nibble of your socks if they take a fancy to them. This is fine for them to do so, although they won’t do so for long because the fabric isn’t usually to their liking. In fact, old socks make great things for guinea pigs to play with, as they can mess around with them and also snuggle up against them. So do bear them in mind for your guinea pigs the next time you are throwing some out. For more things that guinea pigs can and can’t eat, check out our guinea pig food list. Trimming Guinea Pigs nails is a precarious business if you love Guinea Pigs. If its not done properly it can end up hurting the them causing blood loss. So here is a step by step guide to help get it done well. 1. It is best to start off by getting your nail clipping supplies ahead of time. You can purchase specific nail clipping scissors from a pet store or you can use a finger nail clipper or a toe nail clipper which is really good for thicker nails. Toe or finger nail clippers are useful as they can be manipulated easily if you are used to using them. 2. Get some syptic powder in case you cut down to the quick and the nails start to bleed. 5. Find where the quick is on each nail. This is a little vein that runs through the nail and in a guinea pig with a light coloured foot you can see the blood vessel. If you’re finding it hard to see, you could also use a light to highlight where the quick stops. On a light coloured nail it is easy to see and it’s a marker to know how far down to cut the nail. 6. Trim the nail and ensure that you cut in the lighter part and not where any red is. Trim above the quick towards the tip of the nail. If you cut into the quick, the nail will bleed. 7. Repeat the principle for the front nails, just trimming the tips of the nails. 8. Trim the tips for the dark coloured nails. If you have a Guinea Pig with dark coloured nails where you cant see where the quick is, just take the very tip of the nail off. They may seem slightly longer, but you wont be in danger of cutting down and breaking into the quick. 9. Have your Syptic Powder ready. If you happen to cut the nail too short and there is some bleeding, get the styptic powder and put the Guinea Pig’s foot into the powder. The blood would absorb the powder and then clot, thus stopping the bleeding. Make sure that the bleeding has stopped before you put the Guinea pig back into its cage. Trim the Guinea Pig’s nails on a monthly basis. Try and get all the nails done. It can be a stressful operation for both ourselves and the guinea pig but its important it gets done on a regular basis. If you don’t trim the nails, they can grow long and curl around into the pad of the Guinea pigs foot If this happens it can cause infections and pain for your Guinea Pig. However frightened you maybe of trimming the nails it is worth it in the long run, so be brave! You can also take your Guinea Pig to a veterinary or a pet groomers to get this done for you. Something that it is often easy to forget about and neglect when you have a guinea pig is cutting their nails. Guinea pig nail care is a pretty vital part of looking after a guinea pig well. It’s a skill in itself to learn but the more you do it the better you will get at it. The Guinea Pig has nails that grow continually, with a nail on each of the four toes on their front feet and three on the toes on their hind feet. So regular trimming is something that needs to be done often. However if like me, the thought of trimming your Guinea Pig’s nails makes you feel a little uneasy, especially getting it wrong, then be rest assured you are not alone! What happens when you don’t trim your guinea pigs nails? If they are not trimmed regularly, they will continually grow and curl into the footpad. As you can imagine, this could be quite painful for your guinea pig and result in them being unable to stand on that foot. Other things that could happen is that your guinea pig may develop pododermatitis or bumblefoot which are inflammatory reactions that can occur because of infection. However, if you trim them regularly this will give you the chance to check your Guinea Pig’s footpad often for any potential signs of infection. How often do Guinea Pig nails need to be clipped? Clipping your Guinea Pigs nails on a monthly basis will ensure that they do not grow too much. However, letting them grow up to two months is too long. If they are left for extended lengths of time, the bloodline advances close to the tip of the nail and they become more difficult to trim. If you trim them regularly though, the bloodline will recede and the nail is easier to trim without risk of blood loss. What types of clipper shall I use? There are two types of nail clippers you can use. You can use baby sized human nail clippers which are very effective in trimming piggie nails. Use a size of nail clipper in proportion to the guinea pig’s nails. As you guinea pig gets older, you can move on to adult guinea pig nail clippers which can be purchased from any good pet store. They look a little different from human nail scissors and are designed with guinea pigs in mind. Although if your Guinea Pig has darker nails it may be difficult to pick out where the quick is. The chances of your Guinea Pig’s nail bleeding will increase if you cut across the quick. Use styptic powder for any cuts that may occur in the process of clipping. You can also purchase Styptic pencils from any drug store which will help to clot the blood. You can also use aluminum sulfate powder that can be used to stop the bleeding. Some veterinarians sell ‘quick stop’ which is a specialist treatment for ‘quicks’. If clipping nails of your guinea pig, fills you with dread then you could always make an appointment with your local veterinarian or pet groomer who will do this for you. here is no shame in paying someone to do the job for you, as at least it will be done and done so properly. One way of keeping the nails of your Guinea Pig down is to let them ground them on concrete. Another idea is to place stones or rocks in their cages. What this does is to wear down the nails which will save the need for cutting them. What this does is to wear down the nails when they walk on them on the hard surface, which will save the need for cutting them. Do make sure that any surface that they are walking on does not have holes in though so that the guinea pig does not get their legs trapped. They don’t enjoy running around on concrete as much as grass but they will wear down their nails more than grass will. What I do often is to place their run half on grass and half on concrete so my Guinea Pig can get some time running on concrete whilst also enjoying the grass surface as well. What about dark Guinea Pig nails? If your Guinea Pig has dark nails or even black nails then it is very difficult to see where the quick starts and finishes. Just trim the edges of the tips to ensure that you don’t cut anywhere near the quick. However, if the thought of this still makes you feel uneasy, then it might be better to get a veterinarian to trim your Guinea Pig’s nails rather than doing it yourself. When should a guinea pig start having their nails trimmed? Guinea pigs should start having their nails trimmed when they are about two months old. By this time, their nails have begun to protrude and they will need your attention. Because of their small size, baby guinea pigs will need two people to carry out the job. One person will need to hold the piggie with firm hands and the other will trim the nails. Beware of the teeth of baby guinea pigs as they are sharp and can hurt if they decide to bite. So be prepared to be gnawed. They are fragile creatures at that age and so need to be handled with care so you don’t crush them, and firmly so they don’t escape. It takes practice to do this so don’t worry if it doesn’t go well first or even second time around. Getting a guinea pig is a great thing to do if you are looking for a pet for your household. Make sure that they look to be healthy and pink. If there is any sign of inflammation then this can be a sign of bacterial disease. Make sure the guinea pig’s claws are of a good length and not excessively long. There are also guinea pigs that develop flaps of tough skin that protrude from their front feet; these are called spurs. However, they can be removed with a nail clipper. Open the guinea pigs mouth very carefully, and gently whilst supporting its whole body prise the mouth open with your finger. Check that the two incisor teeth and the molars of the upper jaw touch those on the lower jaw. If this doesn’t happen this will be a problem for them in later life. If you see any crusty deposits around these areas then this is not good. They should be slightly moist and bright. If they have watery, crusty, cloudy, ulcerated, receding or protruding this is should cause concern. Make sure that the guinea pig is nicely rounded. If it is thin and limp then that is a bad sign that it has been underfed. Carefully and gently lift the guinea pig holding its body in one hand and supporting its backside in the other and let the spine lean into your hand. Check how it responds to you picking it up. Don’t be put off if the guinea pig is shy. Make sure it is bright, does not have scurfy skin beneath and shows no signs of hair loss. 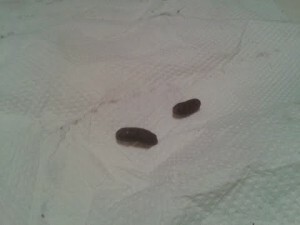 If you see any bald patches then this is a sign of an infestation of mites or even an infection. They should be thin, solid and rounded much like a small bean-like the image below. 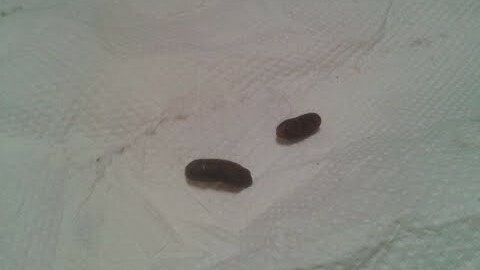 If you see any looseness in the droppings then this indicates a health problem. Make sure it sits up normally without any hunching in its back and runs around actively. Make sure that it is not moving around in circles and has its head pointing up as this can be a sign of blindness. If the guinea pig stays clear of others, it will most likely be calm and peaceful where as a Guinea pig that is in the crowd and runs around a lot will most likely be active and like playing. This can have an impact when getting a guinea pig, especially if you are either buying few cavies.